Here we are discussing one of the most useful data structure, Array. By conventional definition of arrays, "Arrays are the homogeneous collection of data types. But in JS, Arrays simply are the collection of different data types, may or may not be the same. 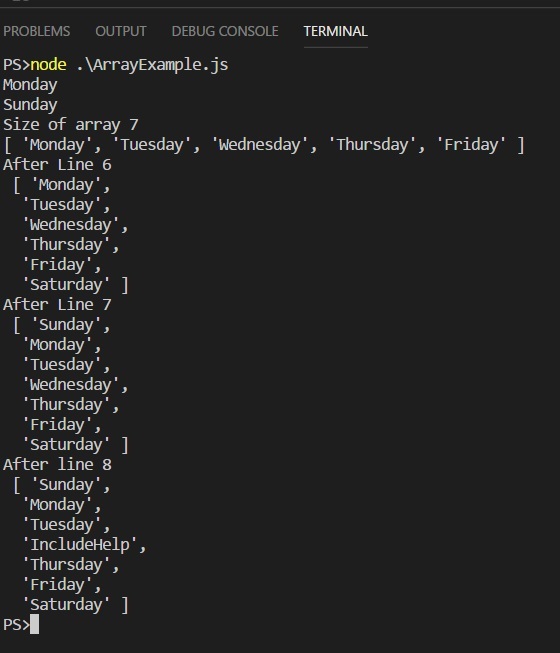 In the above code snippet, we created an array of name week, we created with 7 elements. In line 1 and 2 we used console.log to print the element of our array week. The interesting thing is indexing of the array starts with 0, not 1, that means the index of Monday in our week array will be 0, not 1 and then the last element will become 6. Thus line 1 & 2 we will get a first and last element of the array respectively. Now move to line 3, week.length as the name suggests it return the length of the array, in our case, it’s 7. We can use it as arrayName.length and it will be an integer value. The pop function will delete the last element from the array every time being called, the syntax for it is arrayName.pop(). Therefore, in line 5, we got 5 elements after 2 successive pops. Similarly, shift function will delete an element from the beginning and its syntax is arrayName.shift(). The push function is used to add an element at the end of the array, and its syntax is arrayName.push(element), where the element is data type independent it could be integer floating value or a string. Try uncommenting line 6 and observe what happens. But if we wanted to add an element at the beginning we shall use unshift function which is having a syntax similar to pop as arrayName.unshift(element) like we used in line 7.
arrayName.splice(Index,0, element) this will add the element at the mentioned index without deleting the prior elements, their position will be increment by one.